You want to make it as easy as possible for your customers to learn about the prices of your products or services. Creating a great looking price list can help you simplify that process as well as give any of your sales associates more tools to help them close their sales deals. Using a price list template can make it easy for you to create an organized list of your products or services to help both your sales staff and your customers. When creating a price list, you want it to give enough detail for customers to understand what each product is while not being overwhelmed with too many details. It needs to be easy to reference by your sales staff as well so they can readily answer any pricing questions they may receive. 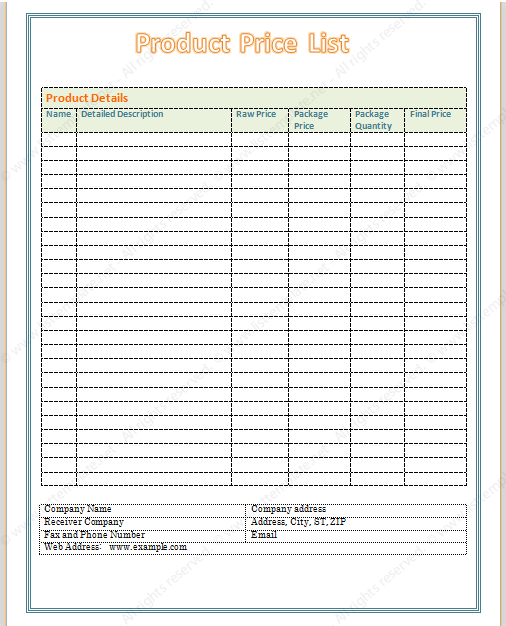 Our price list template contains fields for product names and descriptions to do just that. In addition, you can break the pricing structure down so everyone knows exactly how much something costs and why. This price list template is designed with simplicity in mind and can quickly be edited to add as many products as you need. Each field can be customized to the needs of your business allowing you to create a customized list that looks like it was made specifically for your business. The template itself looks professional and is easy to read for the perfect user experience. Having a price list of all your products can be a very helpful tool for both customers considering your products as well as your staff as try to answer questions on costs and pricing from customers. Our price list template can help them provide customers with the best shopping experience that could even lead to an increase in sales.